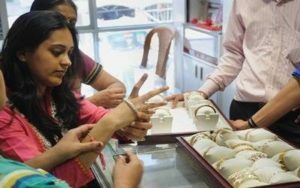 Mumbai : Keeping in tune with expectations, gold sales have notched a sharp fall of 40 per cent this year compared to 2017 Diwali owing to high prices and overall negative market sentiments, a leading retailers body said on Monday. “Though there are crowds, people are not buying as per the expectations, but merely making token purchases of 5-10-20 gm to mark the auspicious day. Mostly gold coins/guineas are moving while small, medium or big articles of jewellery are virtually ignored,” said Mumbai Jewellers Federation President Rakesh Shetty. 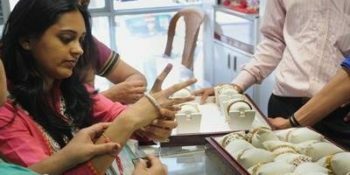 However, another industry body, the All India Gem & Jewellery Domestic Council (GJC), said that contrary to expectations, gold and jewellery sales have zoomed during ‘dhanteras’ and the positive trend was expected to continue till the upcoming winter wedding season. “The past three days have surprised even the industry. People are literally out in droves in shops and showrooms to make gold purchases. 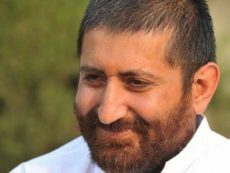 Since two months, till last Saturday, the market situation was extremely gloomy,” said GJC President Nitin Khandelwal. However, this time the purchases – mostly in small jewelleries of 10 gm (1 tola) or multiples – is for end-user purposes and not as investments, with the prospects of gold prices shooting up with the likely increase in US dollar rates soon. “Our expectation is that USD may touch around Rs 85 in the near future given the current international scenario. Along with that, gold itself would shoot up to Rs 45,000 per tola (10 gm). Plus, the upcoming winter marriage season is also driving up the sales,” Khandelwal told IANS. The market sentiments are positive despite the gold rates going up from Rs 30,000/tola in ‘dhanteras’ 2017 to around Rs 31,500/tola this year, which portends good for the industry. Adopting a cautionery stand, World Gold Council Managing Director P.R. Somasundaram said that though the feedback from the industry suggests good footfalls, “the demand could be moderate” in view of the recent sharp increase in gold prices. “Organised players seem better places, a trend that has become evident in recent years after a spate of transparency measures. Digital wallets and online buying also seem to be growing in popularity, though they are relatively small,” Somasundaram said.